The custom RF filter surface mount packages shown represent the base core style of our surface mount technology. The packages are offered in both straight metallization and solder mask. Links to the detailed outline drawings are shown to the side. 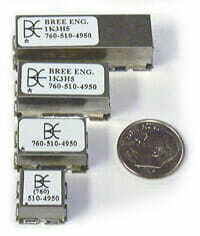 Click here for a link to a matrix of many application specific versions Bree offers for surface mount technology. All surface mount packages can be applied using SN 63 solder. They can also be made using higher temperature solders allowing installation using SN95 solder. See the link to recommended solder profile. The recommended frequency limit for these packages is 3GHz. However this can be extended to 6GHz + with special considerations for the 50 ohm input/output configuration. These considerations can be special test fixtures, matching circuits as part of the filter or other options as needed. Copyright 2018 - Bree Engineering Inc.